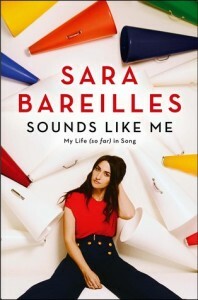 In the intro to this memoir, Sara Barielles writes that she hopes the essay sound like her (hence the book title). She hopes that we feel at home with her voice, that this is just a conversation between some friends and she’s got the floor for now. As someone who has listened to her music for years but has never seen her in person, I think the book accomplished her goals by a mile. The book contains 8 essays about 8 of her songs – 7 from commercial releases and the last from the upcoming musical Waitress, which she penned the music and lyrics for. My favorite chapter by a country mile was the chapter for “Brave”. Even if you’ve never heard of Bareilles, you’ve heard that song – it was the Windows 8 campaign song that was so ubiquitous for so long a few summers ago. To read about the process of crafting that song and how it spoke to so many people was lovely. I’m a process nerd and even though I grew up musical and still sing as an amateur performer, I know nothing about songwriting. I loved this chapter. You can tell she’s not a writer of prose – the structure is clunky at times but still feels over-edited as though she wasn’t confident in what she wanted to say so nit picked it to death (spoken like someone who does that all the time). Nonetheless, the book is a refreshing and honest look into the head and soul of an artist I am excited to continue to support. I enjoyed this one – because I read it on my lunch break – with a Diet Coke, but I’d go for a fun and flirty cocktail, like a Cosmo if I had my complete druthers. I received a copy of this book from the publisher via NetGalley in exchange for a fair and honest review. Thanks!